Oren Harman is the chair of the Graduate Program in Science, Technology, and Society at Bar-Ilan University, Ramat Gan, Israel, the author of The Man Who Invented the Chromosome and The Price of Altruism, and coeditor of Rebels, Mavericks, and Heretics in Biology. He lives in Tel Aviv, Israel. Michael R. Dietrich is a professor in the History and Philosophy of Science Department at the University of Pittsburgh. and coeditor of The Educated Eye and Rebels, Mavericks, and Heretics in Biology. "They may infuriate even as they inspire; destabilize, as well as advance. The visionaries of biology, note science historians Oren Harman and Michael Dietrich, are masters of 'dramatically bold, even fantastic' thinking about big problems. This compelling edited volume explores the work of 19 innovators, including Iranian-American cancer researcher Mina Bissell, who studies tumour microenvironments; Canadian John Todd, who engineered solar aquatic sewage treatment; and Peter Kropotkin, the Russian biologist who championed mutualism in nature during the Darwinian revolution." "The volume is insightful and engaging; readers will come away with a desire to explore the lives and works of these scientists in more detail. . . . Recommended." "Sciences stay lively only thanks to regular injections of big, bold thinking and doing. 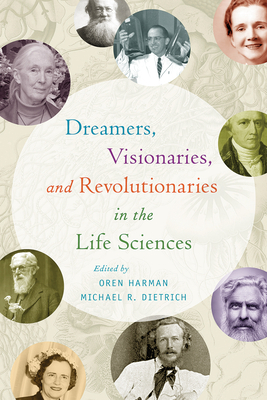 Dreamers, Visionaries, and Revolutionaries in the Life Sciences tells the stories of some of biology's greatest boundary–pushers, from Lamarck (who gave biology its name) to Lovelock and beyond. Prepare to be instructed, inspired, amazed, and—occasionally—appalled." "Dreamers, Visionaries, and Revolutionaries in the Life joins Rebels, Mavericks, and Heretics in Biology (Yale, 2008) and Outsider Scientists: Routes to Innovation in Biology (Chicago, 2013) in presenting looks at individual scientists who are non-standard in illuminating ways. Harmon and Dietrich have enticed their contributors to think about the role of individual scientists and how they helped shape science in society. They then pull together the individual biographies with valuable cross-cutting interpretive introductions. Joan Roughgarden’s epilogue captures the book’s message beautifully. To those who feel they don’t quite fit: “If you’re a scientist dreamer, let it happen; don’t fight it. Really, you have no choice. It’s what you are. In the end, you might be correct, after all. And remember, be a disciplined dreamer. The scientist dreamer must aim to tell a true story, not a fantasy.” To the rest of us: “If you’re not a scientific dreamer yourself, but know someone who is, be kind to them.” We should be kind because the dreamers stimulate us all ro think and be better than we otherwise would. The brilliant Lynn Margulis might have infuriated almost everybody, as the editors note, but she also provoked us in the best possible ways and changed our thinking about life." "This spirited collection not only provides intriguing biographies of life scientists whose histories have often been overlooked, but also forces us to revisit our usual narratives of how biological change is generated to consider the role of true novelty, especially in the hands and minds of quirky, eccentric, and oftentimes plain ornery characters in the right places at opportune times. Scientific advances come not only from experiments and theories but from creative and even outlandish dreams, and this volume brings together some of these radical dreamers and their stories to generate as many new questions as are answered, much as these scientists did in their own times."